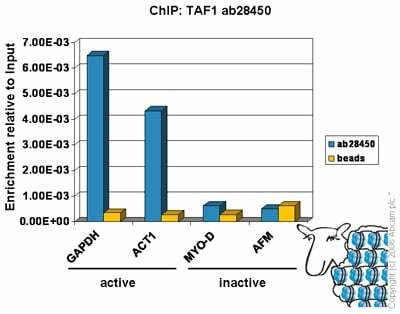 ab28450 recognises transcription initiation factor TFIID subunit 1 (TAF1). Synthetic peptide within Human KAT4/ TBP Associated Factor 1 aa 1823-1872 (C terminal). The exact sequence is proprietary. Daudi cell lysate, Human kidney tissue. Our Abpromise guarantee covers the use of ab28450 in the following tested applications. WB Use a concentration of 0.5 µg/ml. Predicted molecular weight: 212 kDa. Good results were obtained when blocked with 5% non-fat dry milk in 0.05% PBS-T.
ChIP Use 5-10 µg for 25 µg of chromatin. Largest component and core scaffold of the TFIID basal transcription factor complex. Contains novel N- and C-terminal Ser/Thr kinase domains which can autophosphorylate or transphosphorylate other transcription factors. Phosphorylates TP53 on 'Thr-55' which leads to MDM2-mediated degradation of TP53. Phosphorylates GTF2A1 and GTF2F1 on Ser residues. Possesses DNA-binding activity. Essential for progression of the G1 phase of the cell cycle. Defects in TAF1 are the cause of dystonia type 3 (DYT3) [MIM:314250]; also called X-linked dystonia-parkinsonism (XDP). DYT3 is a X-linked dystonia-parkinsonism disorder. Dystonia is defined by the presence of sustained involuntary muscle contractions, often leading to abnormal postures. DYT3 is characterized by severe progressive torsion dystonia followed by parkinsonism. Its prevalence is high in the Philippines. DYT3 has a well-defined pathology of extensive neuronal loss and mosaic gliosis in the striatum (caudate nucleus and putamen) which appears to resemble that in Huntington disease. Belongs to the TAF1 family. Contains 2 protein kinase domains. Phosphorylated by casein kinase II in vitro. 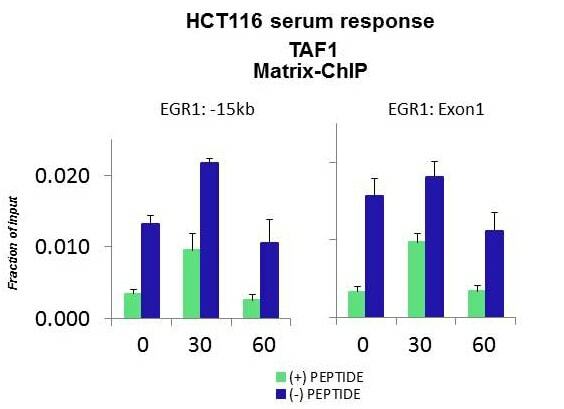 Quiescent human colon carcinoma HCT116 cultures were treated with 10% FBS for three time points (0, 15, 30 minutes) or (0, 30, 60 minutes) were used in Matrix-ChIP and real-time PCR assays at EGR1 gene (Exon1) and 15kb upstream site. 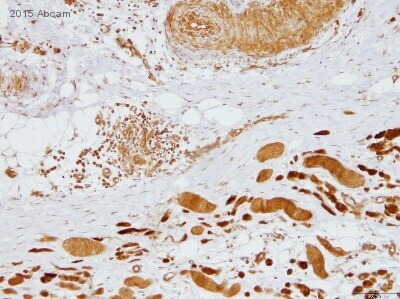 This image shows human kidney stained with ab28450 at 8µg/ml. Magnification 400x. Chromatin was prepared from Hela cells according to the Abcam X-ChIP protocol. Cells were fixed with formaldehyde for 10mins. The ChIP was performed with 25µg of chromatin, 8µg of ab28450 (blue), and 20µl of Protein A/G sepharose beads. No antibody was added to the beads control (yellow). 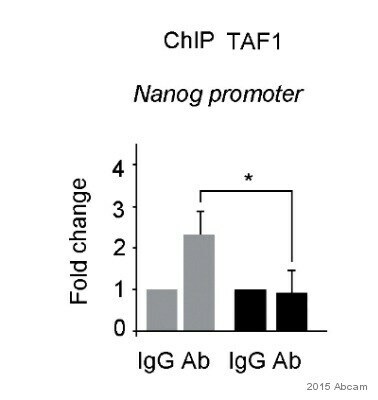 The immunoprecipitated DNA was quantified by real time PCR (Taqman and sybr green approach). Primers and probes for the actively transcribed genes GAPDH and ACT1 are located in the core promoter. Publishing research using ab28450? Please let us know so that we can cite the reference in this datasheet. Thank you for your enquiry. 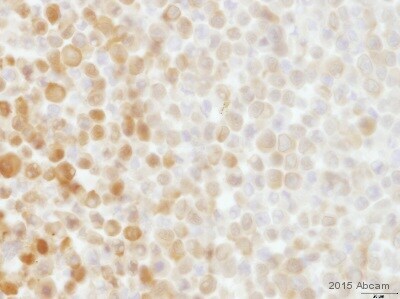 I am sorry to hear that you have been having difficulties with this antibody. 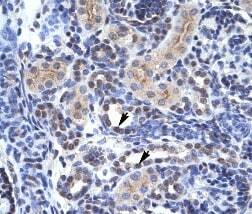 This antibody has been applied by Abcams chromatin postdoc scientist by adding 5-10µg of antibody to 25µg of chromatin. Please can you tell me the mass of chromatin that you have been using in relation to the mas of chromatin; is this determined? I was interested in the duration of fixation that you have been using. in my opinion a 5 minute duration is a little short, a duration that is suitable for the chromatin immunoprecipitation of histone modifications but not chromatin associated (transcription) factors. We commonly use a 10 minute duration of formaldehyde fixation. Our XChIP lab protocol can be located at the following link; www.abcam.com/chip I would also like to know the region of GAPDH that you are amplifying; the primers that my colleague uses amplifies the core promoter region of the GAPDH gene. I look forward to hearing from you.